Upgrade Radiolink 2.4G 10CH system Radiolink AT9S Radio Transmitter 9CH R9DS Receiver Controller S-BUS for RC Drone Quadcopter. AT9 Upgrade to AT9S , Welcome to purcase , if you have any questions , please message us , thank you. Only the Orange color support. English,ish, German, Italian, French, Turkish, Russian, Korean and Chinese menu. The grey color support Chinese and English. DSSS and FHSS spread-spectrum technology working synchronously, 16 channels pseudo random frequency hopping, QPSK modulation ensure excellent anti-interference performance, free from 1.2G&5.8G image interference and 433MHz data transmission interference. Even can controlled normally in city center. STM32F103VET6(32-bit RISC core operating at a 72 MHz frequency, 512 Kbytes of Flash memory, two 12-bitADCs). TI CC253, the most advanced chip ever in a RC transmitter. Ground 900 meters and air 1500 meters. THE MOST FULL TYPES AND FUNCTIONS. Suit for all airplanes including helicopter 8 swash plate modes, fixed wing 2 airfoils 3 rears, gliders 4 airfoils 2 rears and multicopter, RC cars and boats. Support signal strength, receiver voltage monitored, and extended engine voltage telemetry module PRM-01 and OSD info telemetry module PRM-02. PRM-02 can feedback GPS, SPEED, voltage etc. On AT9S display when work with flight controller APM or PIX. SBUS, PPM and PWM SUPPORT. S-BUS, PPM and PWM signal possible working at the same time. AT9S sells with receiver R9DS, SBUS and PWM signal output simultaneous. Also, compatible with diversity antenna receiver R10DS, support SBUS and PWM signal output simultaneous. Supper mini receiver R6DS, support SBUS, PPM and PWM signal output. R6DS, with the super mini size 2516mm and the 3.9 grams weight, support SBUS, PPM and PWM signal working at the same time, easy to connect and never burden to your drones, is the best choice for drone! Switching Mode Power Supply ensure the operating current keep to 90mA when using 3S LiPo battery, a half or even one third consumption of the similar products. Brand new hardware design of AT9S solve the interference of SMPS. With a 1800mAh, 3S LiPo battery can working more than 12 hours. Do not worry about that damage your transmitter even connect anti-polarity. 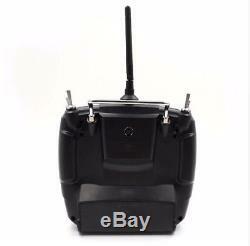 Ensure multiple battery support, 8pcs AA batteries or 2S-4S LiPo battery and other kinds of batteries. 4096 section precision, the max PWM signal jitter is 1.84us, and the regular jitter is 0.5us ensure servos anti-shake rudder. Low RSSI vibration alarm setting, low transmitter voltage, receiver voltage and extended engine voltage alarm. Vibration, DD sounds and words alarming avoid any ignorance in a noisy condition, ensure a safe flight. Navigation menu offering next step, simplified the operating and setting. Upgrade by a USB cable keeps always the most advanced system and program. The USB data backup copy function of AT9S help you save and copy parameter settings easily. Basic menu, advanced menu, graph view for varieties of throttle and servo curve, 5-10 channels are customized. Simplified the multicopter attitude menu setting, even beginners can set easily! Two knob switches, two slicer switches, three three-gear switches, four two-gear switches, a reset trainer switch. Support multiple aerial control mode and PTZ control. VR switches are galvanized and sub UV design. Programmable mix control , The most full types and functions Humanized switch positioning, Navigation Menu, PROGRAMMABLE MIX CONTROL, Green and low consumption:90mA operating current, MULTIPLE ALARM PROMPT. AT9S First transmitter with DSSS and FHSS Spread Specturm Support SBUS, PPM, and PWM, 3ms quick response Multilanguage, Data telemetry, Low RSSI alarm setting Control distance: 900 Meters ground 1500 Meters air. Size: AT9S- 183100193mm, R9DS- 412314mm 2. Frequency: 2.4GHz ISM band (2400MHz to 2483.5MHz) 4. Channel bandwidth: 5.0 MHz & 250Kbps 6. Spread spectrum: DSSS ;FHSS 7. Adjacent channel rejection: >38dbm 8. Transmitter power: <100mW (20dbm) 9. Operating current: <90mA 12V 10. Operating voltage: 7.4 18.0V 11. Control distance: more than 900 meters ground, 1500 meters air, the actual control distance depends on the flying environment 12. Channel: 10 channels, 5-10 channels are customized 13. Compatible model: include all 120 degree and 90 degree swash-plate helicopter, all fix wings, glider and multi-rotor 14. Simulator mode: under the simulator mode the transmitter action turn off, change to power saving mode 15. Screen: 2.8 inches 16 colorful screen, 240320 pixels 16. 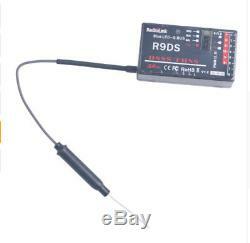 Support receivers: sells with R9DS (SBUS;PWM) ;Also support R10DS(SBUS PWM) and R6DS(SBUS;PPM;PWM). 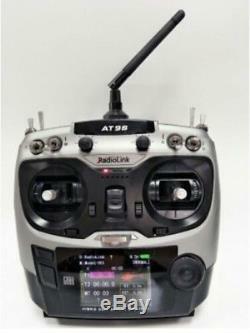 R9DS 2.4G 9CH DSSS Receiver. RX voltage and signal strength telemetry, extensional sensor for EP, Temperature, RPM, GPS etc. CH9 is set for S.
All 9channel needs 3ms to response parallel. Section precision 4096, stable the servo, rudder shaking free. HV input up to 10V. MINI design for convenient assembling and operating. Specifications: Channel: 9channel, CH9 is for S. BUS Max input voltage: 10V Current: 38-45 mA(Voltage input: 5V) Size: LWH=432415mm Section precision 4096. Not included R6DS Receiver, Client can message us for the quotation of AT9S+. 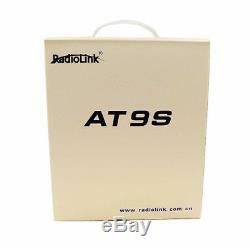 The item "Radiolink AT9S 2.4G 10CH System Radio DSSS FHSS Transmitter 9CH R9DS Receiver" is in sale since Wednesday, December 27, 2017. This item is in the category "Toys & Hobbies\Radio Control & Control Line\RC Model Vehicle Parts & Accs\Other RC Parts & Accs". The seller is "game-jmt" and is located in . This item can be shipped worldwide.